Every adult, not just in Morgan County, but across the nation likely understands the fear that comes from feeling overwhelmed and lost. Churches in Mission began with the efforts of three ministers in October, 1987 to work together to serve those in poverty in Morgan County, those who live with fear and need every single day. 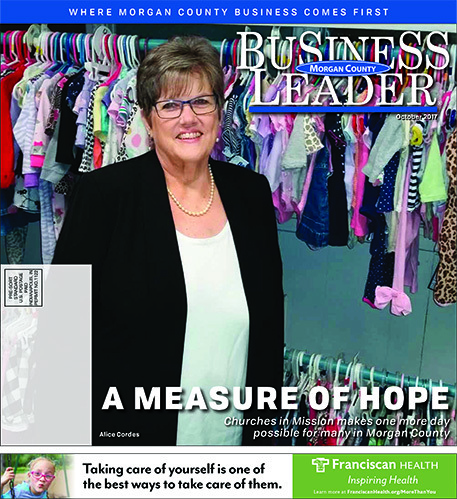 What began as three churches combining efforts now includes financial and material support from more than a dozen Morgan County churches and several local businesses and other not-for-profit organizations. A second location in Martinsville has opened in addition to an educational location, Hope House, in Mooresville. Individuals and families who qualify can get food, household items, and clothing at Churches in Mission. Some can also get limited financial assistance for necessities such as housing and utilities. Every week the organization purchases approximately $2,500 in food in addition to donations. Everyone loves the fresh produce donations from home gardens, because most food purchased is non-perishable. Many organizations, including schools and businesses, host food drives for the pantry. Homeless, especially youth, come to the door looking for help finding shelter. Volunteers offer all the help and resources they can, but there are many times that resources are stretched beyond capacity already.